Choose your own selection of salami & chorizo from Cornish Charcuterie's award-winning range. 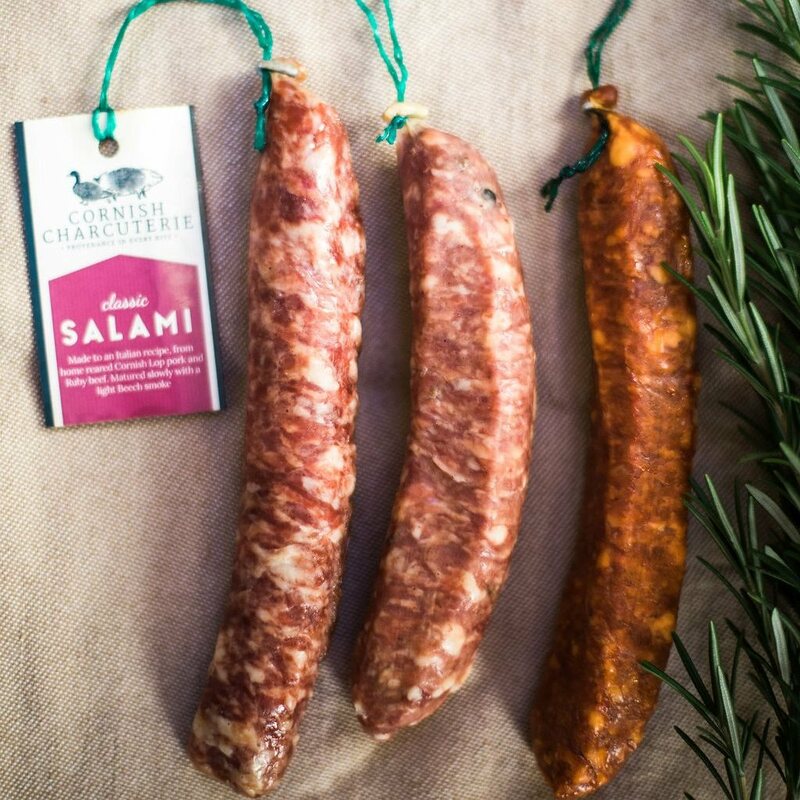 They handcraft their charcuterie using the finest ingredients, including their own home-reared free range Cornish Lop pork. 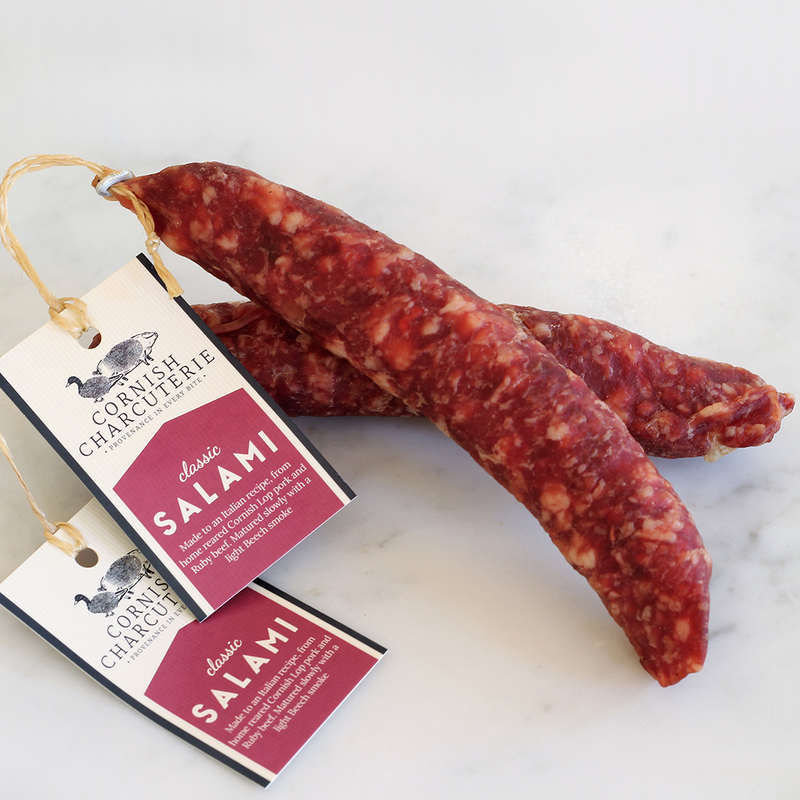 If you are looking to put together a special charcuterie board, these salamis make an ideal addition. 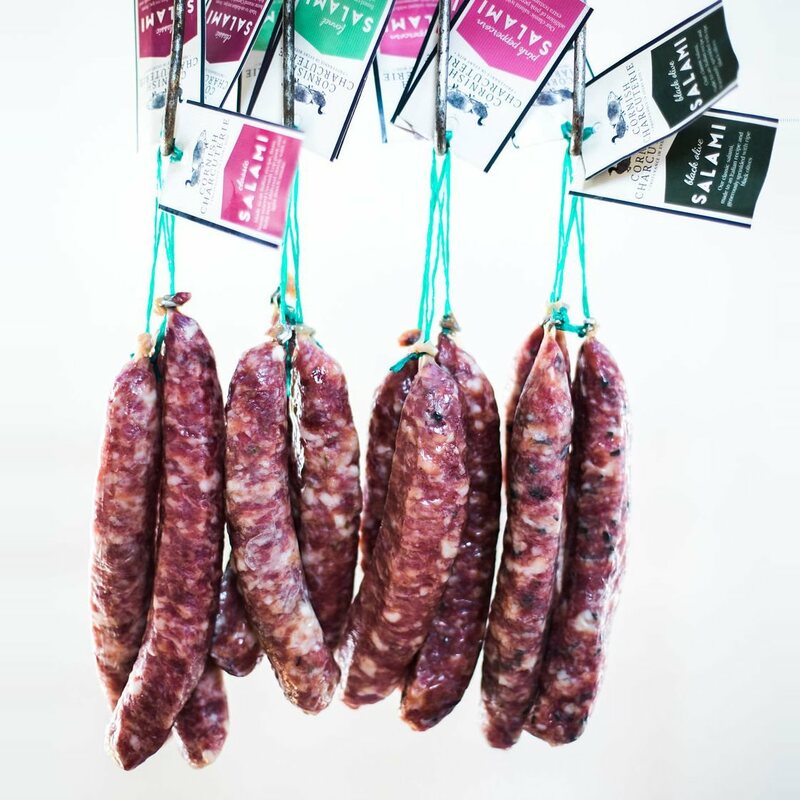 Cornish Charcuterie create their artisan salami and chorizo on their own farm on the Cornish coast, using traditional methods to prepare the charcuterie then seasoning and maturing them to perfection. 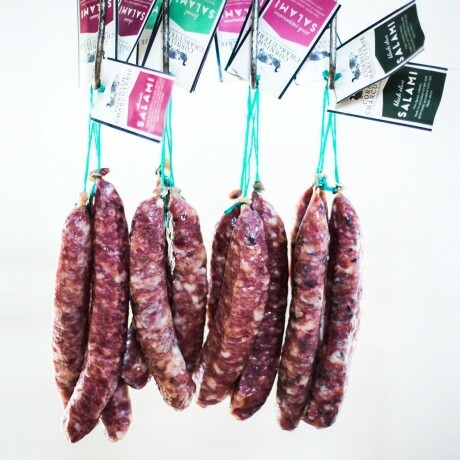 A perfect traditional & rustic addition to any picnic basket, hamper or charcuterie board - and they look just fantastic hanging up in the kitchen. Pack of 5 salami sticks, 32mm/80g each. Please choose your flavours using the options on the right. Storage: The sticks can be stored in a cool, dry place and have a shelf life of 4 weeks. Classic Salami Stick: pork 98%, beef 36%, spices, salt, preservative: E250 sodium nitrate. Seaweed & Cider Salami Stick: Pork 98%, Beef 36%, Cornish Cider 1.8% (sulphites), seaweed (1%), spices, salt, preservative: E250 Sodium Nitrate. 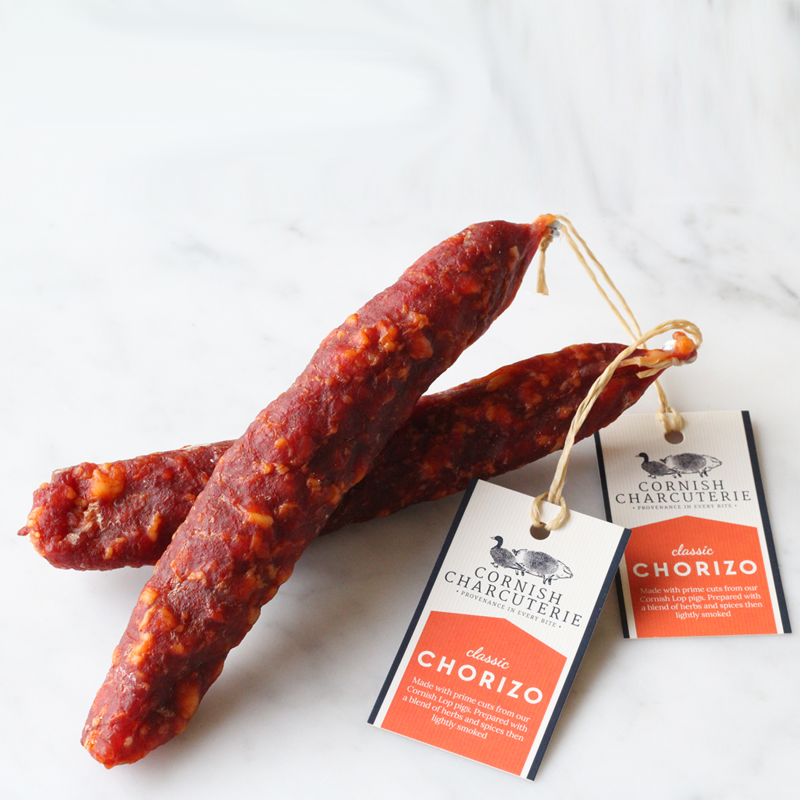 Traditional Chorizo Stick: pork 178%, spices, salt, preservative: E250 sodium nitrate. Black Olive Salami Stick: pork 98%, beef 36%, black olive 1.5%, spices, salt, preservative: E250 sodium nitrate. Chilli Chorizo Stick: pork 178%, chilli flakes 0.40%, spices, salt, preservative: E250 sodium nitrate. Amazing salami thank you, the fennel, lamb and seaweed sticks were all really lovely in taste and texture. Great price too! I love these sea salt ones, finally a basic but delicious thin. I love these sea salt ones, finally a basic but delicious thin. There are many out there with pompous flavours but these cater to my plain taste. But they are just so good. Work well with cheese and also humus. Creators of award-winning artisan British Charcuterie, and fine savoury biscuits, from the finest Cornish ingredients.